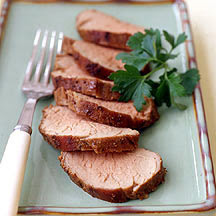 My mom makes pork tenderloin all the time and I love it! I found this low-cal recipe and love it because it takes no time at all to make, and can be made the night before. As with my mom's recipe - I bet you can use this same recipe for beef tenderloin, adjusting cook time. In a large zip-lock bag, combine syrup, dry mustard, cloves, ginger, salt, cinnamon and pepper. Trim pork of all of visible fat and cut each tenderloin in half widthwise.. Add tenderloins to plastic bag, squeeze out air and seal bag; turn to coat. Place bag on a plate and refrigerate on bottom shelf, turning occasionally - at least 2 hours or overnight. Preheat broiler. Place tenderloins in a roasting pan and pour marinade over them, Broil 5 inches from heat until pork reaches and internal temperature of 160 degrees, about 6 minutes per side. Let stand at room temperature for 5 minutes before slicing. Yields about 4 ounces of meat per serving.